GRAND 3 BEDROOM, 3 BATHROOM WITH -CREEK /MOUNTAIN /VIEWS CLOSE TO RESTAURANTS -. Our daily rate is set to accomodate only 6 guests. Additional persons will result in an extra charge of $50 per person per night. Pets are not allowed. If there is a pet present during your stay an additional charge of $50 per pet, per night will result. Beautifully just renovated house with frontage on Stony Clove Creek, two and a half miles from Phoenicia, NY in the heart of Catskill mountains. Near Hunter, Windham and Belleayre mountains. Great restaurants nearby. 30 Minutes from Kingston, NY. The creek is good for swimming, fishing and picnicking. The house has a large open deck facing the creek. Mountain and creek views from all the windows!! PROPERTY IS BORDERED BY STONY CLOVE CREEK AND SURROUNDED BY MOUNTAIN VIEWS. IT IS A SECLUDED RETREAT WHERE YOU CAN ENJOY THE SERENITY OF THE MOUNTAINS. THE PROPERTY PROVIDES THE OPPORTUNITY TO SKI BELLAYRE AND HUNTER MOUNTAINS IN THE WINTER. THIS PROPERTY IS NEAR THE EMERSON HOTEL SPA, THE TOWNS OF PHOENICIA AND WOODSTOCK AND ONE CAN ENJOY THE MANY RESTAURANTS IN THE AREA. OF THIS AREA. This is a unique piece of property nesteld in a mountain surrounded by Stoney Clove creek. The unque views from every room are idillyc and the sound of the water is very relaxing and therapeutic. The long ladting rest experience of - Serenity mountain retreat is unforgetable and certainly wirth every minute and dollar that you spent. Go for it and book today. toilet, shower, jetted tub, MASTER SUITE: has a jetted jacuzzi for two. EMERSON HOTEL RESORT equipped with gym, spa, outdoor jacuzzi, swimming pool, massage services, restaurant services. This resort is located 10 minutes away from this property. House faces CREEK and MOUNTAIN VIEWS in a very pleasant rural setting . off of route 214. MOUNTAIN AND CREEK VIEWS from almost every window of this house. Close to ski resorts: Belayre: 15" Hunter:20' Windhan: 30' Bistro to go on route 28 on the way up to the property has --GOURMET TAKE OUT. Beautiful house in Perfect Condition. Will stay again. My husband and I rented this property for ten days- a few days preceding and a week following our wedding at nearby Full Moon Resort. The house itself would be impressive anywhere- beautiful upgrades, gorgeous kitchen, wood burning fireplace in the common room, gas fireplace and huge soaking tub in the master. The best part though are the massive windows and minimum 4 sliding glass doors (2 more in the master) that give a panoramic openness to the place. You don't really need the fans on with the cross breeze from 4 sliding glass doors. The deck surrounds the house and would be perfect for entertaining, but we mostly just lounged on the furniture with our morning coffee. Beyond the deck is basically your own private nature preserve, nestled into the alcove of a creek. The grounds are really the best part. It was lovely waking up each morning to the sounds of the water. Our only neighbors were a baby deer, his mom, innumerable chipmunks and a family of adorable baby beavers. It felt like we were staying at a Disney resort. We will absolutely be back, it was so hard to leave. A couple things to keep in mind: there aren't tv's in the two smaller bedrooms, so if you're someone who needs to watch tv before bed you'll want to bring a laptop or something (though the creek sounds were enough for us). Also, the master is far and away the nicest bedroom in the house. The other bedrooms are fine (one has an en-suite), but if we hadn't been covering the cost for everyone it mightve been a little awkward asking them to split the bill evenly. That being said, it worked out great for our wedding weekend. It's a bit rustic in that you have to drop your garbage at the recycling center (not keeping garbage outside is ideal, don't want to attract too much wildlife) so bring a few extra garbage bags. It's a short drive and $2 per bag of garbage, recycling is free. You have to sort the recycling, so it's actually easier to just put the beer cans back in the box as you use them etc. This isn't really a big deal to be honest, and was actually nice to have a sense of accountability. It took maybe 5-10 minutes once we were there - I'm only mentioning it because it's not something I was aware of initially. This was a beautiful rental and we will remember our honeymoon forever. We'll be recommending it to everyone. Definitely stay if you get the chance. Wanted to share my birthday celebration by inviting family to a weekend of skiing at Hunter Mtn. So happy I found the perfect place in Chichester. About 15 mins from Hunter. And less than that to Phoenicia which was quaint little town with some very nice choices for eating - Phoenicia Steakhouse, Tavern 214 and Brio all very good. 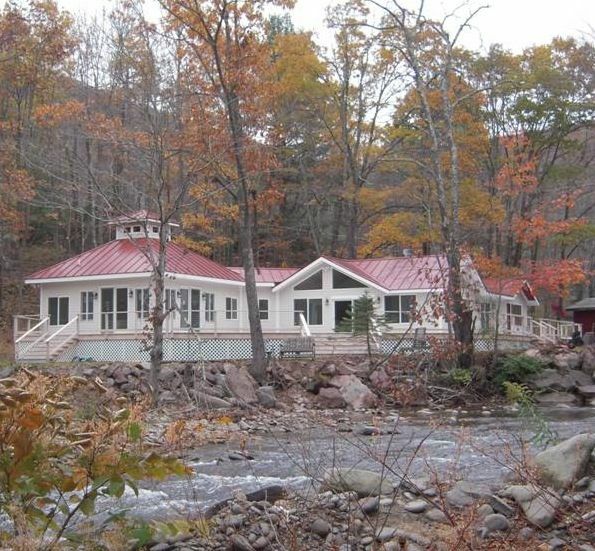 Besides the proximity to Hunter (and Windham) and fine dinning the house is situated on a lovely little creek that feeds the Esopus. The owners made us feel very welcome as guests - almost as if it was our own home. The owner let us return to the house on our last day after skiing. We didn't check out until after 5 without issue or additional charge. With real estate its all about location and this hideaway has it. Newly refurbished, the place was immaculately clean and fresh. I especially loved the floor plan. The large open kitchen area with adjoining living and dinning rooms were perfect for family to gather to play Scrabble, Texas Hold Em, sit by the wood burning fireplace and/or watch TV. This spacious area was well lit with windows and sliding glass doors all around. Easy to enjoy the lovely scenery outdoors. Propane fireplace in the master bedroom suite too. MB was large and well away from the other two bedrooms. Each couple had their own private bathroom. Would stay again. Possibly in another season for a little trout fishing or hiking trek. questions from this guest to owner were very clear and to the point. Guest followed owners HOME CARE instructions. And thank you for staying with us. Our entire family really enjoyed this wonderful home. It's bright and airy and spacious inside. The murmuring stream just in the backyard was a joy for the kids. The host Olga was most helpful and kind. My family and I spent Columbus day weekend at the house and it was great! The location was perfect, about a 5 min drive to Phoenicia and 25 min to KAATERSKILL falls which was a beautiful afternoon hike. The house's property is perfect for a family lots of outside space, with a wonderful creek running through the backyard, and a big room inside the house to relax. This home was absolutely impeccable. High end feel in every inch of the house. The master bedroom has wall to wall windows with beautiful views of the creek. The entire house had huge Windows and multiple sliding doors which made the house feel very open. Even without air conditioning it was very comfortable despite the heat as there was a good cross breeze and ceiling fans everywhere. Going to sleep we could hear the sounds of the creek which was incredibly calming. The master bath had a huge Jacuzzi tub also with views of the creek. The house had an open feel with plenty of room for all of us. The deck on the back wraps the length of the house and was huge! Each couple had their own bathroom, 2 of which were within the rooms. We were able to build a fire pit with permission from the owner and sitting out under the stars with smores by the fire was wonderful. We were able to play in the creek as well. The town of phoenicia is just a couple miles away with cute shops and great restaurants. Tons of hiking trails nearby as well. The only complaint we had was having to take our trash with us when we left. On a Sunday, the options were limited and were out of the way for any of us. Other than that, we had a wonderful experience. The owner was very accommodating and the house is one that we wish we could stay at forever! GOOD DINING RESTAURANTS IN THE AREA SUCH AS - THE 4 SEASONS CATSKILL INN- THE BEAR CAFE AND CUCINA IN THE TOWN OF WOODSTOCK. IN PHOENICIA - you find BRIOS (WOOD BURNING PIZZA) AND EXCELLENT FOR BREAKFAST LUNCH AND DINNER.